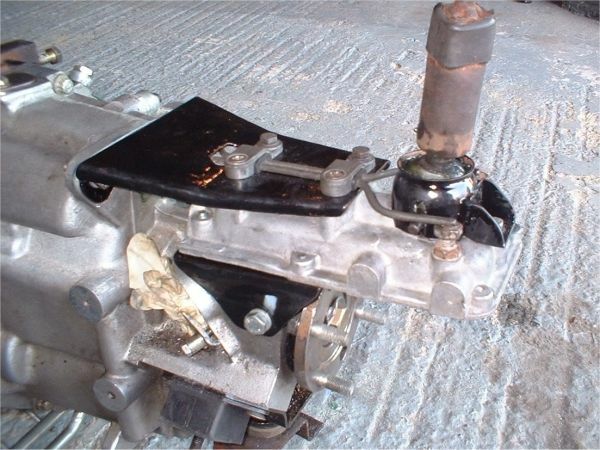 The Rover SD1 gearbox is renowned for having a poor gearchange particularly when cold. The guy who sold me this gearbox had invested nearly £2k on a Borg Warner T5 box as he was fed up with the gearchange on this R380 gearbox. (The R380 gearbox is based on the LT77 SD1 box and was fitted to the later MG RV8). I found that the gear lever remote extension placed the gearlever about 45mm too far back in the transmission tunnel in my MGB so the extension needed to be shortened. I had a good look at the gearbox and remote extension and found that the SD1 reverse detent wasn't needed as the R380 gearbox had a built in reverse inhibitor. The reverse light switch wasn't required for the same reason. Most importantly I found it very difficult to select gears due to the slop in the extension mechanism. 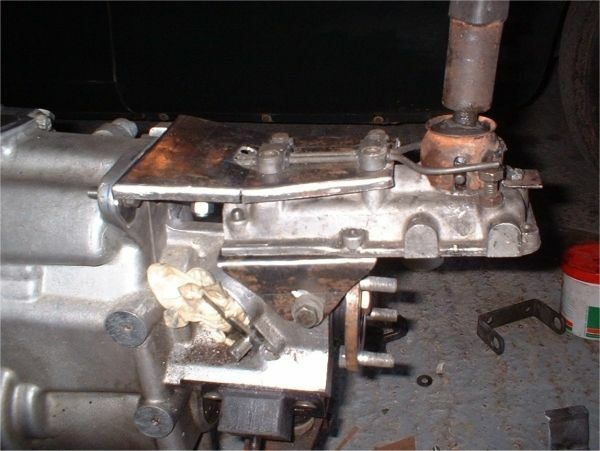 The mechanism was rubber mounted which wouldn't have helped, but most of the slop appeared to be due to a loose fit of the remote shaft in it's bearings and the sloppy action of the crank connecting the remote shaft to the main gear selector shaft. This page details the modifications I made to the linkage to reduce the length and to improve the gearchange. This picture shows my new mounting for the remote shaft. 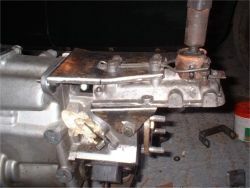 I connected the remote shaft directly to the main selector shaft in order to eliminate the second crank. 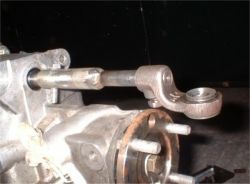 This lowers the selector crank to maybe 5mm above the propshaft flange. This should be enough in my installation but might cause problems in other installations where the rear axle travel is greater. I found that the tubing from a Volkswagen Polo wheel brace was a perfect fit over the main selector shaft. I welded this to the remote shaft, and drilled a hole to bolt it to the main shaft. I made some 2mm steel brackets to secure the shortened remote unit to the gearbox. The remote is angled up towards the rear to raise the prong in the bottom of the gearlever away from the propshaft. The top bracket is secured by the bolts that secure the gearstick centralising spring. The photograph was taken before I welded up the reinforcing flange. The lower bracket was made in 1 piece and is secured to the original lower bracket mounting holes as well as the dust cover mounting holes. There isn't any room for a dust cover in this installation, nor would there be room for the reverse detent mechanism. The brackets hold the gearstick much more firmly than the original brackets, and the gearchange quality is now excellent. I also welded a couple of flanges onto the gear lever mounting bracket as these are notorious for breaking off. I might have to modify the gearlever itself a little as it exits the transmission tunnel just a little too far to the right. The gearshift works reasonably well in the car. It's very precise but sometimes a little notchy - particularly when going into reverse and changing down to second or first. There is quite a wide gait - presumably due to my modifications, but it's fine with a short gear lever.